While Soldiers wear camouflage to blend into the environment, it is also important to ensure ground vehicles are not easily detected. The Army now has a new advanced coating system for ground vehicles that suppresses ground vehicle heat signatures, making the vehicles much more difficult to detect. 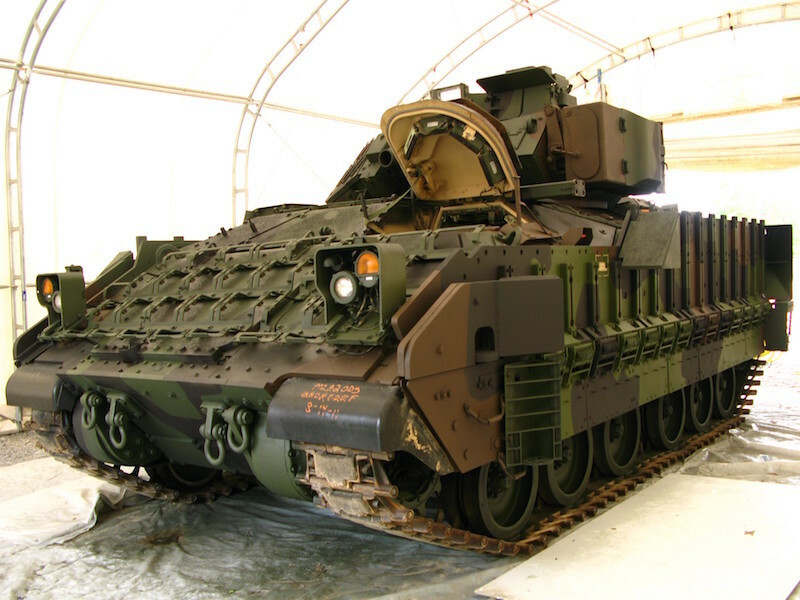 The Ground Vehicle Coating System was developed by a joint venture between the Combat Capabilities Development Command (CCDC) Ground Vehicle Systems Center (GVCS), the Combat Capabilities Development Command Army Research Laboratory (ARL) and the Army’s Manufacturing Technology program to reduce detectable infrared signatures that are emitted from vehicles, making them much more difficult to detect and track. This new coating also mitigates the effects of chemical agents that adversaries may use to injure, incapacitate or kill Soldiers. «This technology is significant because it embraces the spirit and direction of the Army Futures Command to develop, create and implement technologies that ensure dominance on the battlefield. The technology will be the foundation of a variety of alternatives that will meet and overcome emerging threats to Army platforms», said Thomas Wagner, CCDC Ground Vehicle Systems Center engineer. The Army’s Manufacturing Technology program, known as ManTech, provided the necessary funding to work with industry to develop, refine, test and validate a process for manufacturing Chemical Agent Resistant Coating-compatible paint products that aid in vehicle detectability avoidance. In addition to reducing the cost of the coating per gallon by approximately 75 percent from when the program originally started, the coating can be applied to vehicles in existing facilities, including depots and arsenals, using equipment already in the Army’s inventory. This will decrease application costs and increase production output. “Working with industry allowed for quicker implementation of manufacturing techniques, which enabled the product to be produced on a larger scale. Concurrent Technologies Corporation’s long history of taking engineered products and optimizing designs and processes to reduce per unit prices will allow the Army to gain an advantage that it otherwise may not have,” Wagner said. By working with the Army, CTC was able to tailor the GVCS to each system’s requirements, allowing for future capabilities as threats change. The new coating does not require additional space, weight or power requirements, which is especially important as the Army focuses on next-generation vehicles that are not only more lethal and survivable than current platforms, but also smaller, lighter and more fuel efficient. While CCDC ARL managed formulating, testing, verification and validation of the technology, ongoing efforts will be coordinated with the CCDC Ground Vehicle Systems Center to manage requirements, specifications and updates for the technology to enhance its properties for emerging threats and future needs. In 2018, the team worked with the U.S. Special Operations Command (SOCOM) to develop gray color variants for small watercraft, which resulted in significant cost avoidance for SOCOM. The coating system has joint service appeal since it can be formulated in multiple color variants. The GVCS program has transitioned to Program Executive Office Ground Combat Systems, which plans to implement the GVCS across its portfolio, including the Bradley fighting vehicle, Abrams main battle tank and the Stryker family of vehicles. First Unit Equipped is scheduled for Second Quarter FY21. The CCDC Ground Vehicle Systems Center, CCDC ARL and the ManTech Program Management Office work closely with Army leadership to identify projects that support the Army’s greater science and technology strategy. CCDC was formerly known as the U.S. Army Research, Development and Engineering Command. In a recent realignment, CCDC moved from the Army Materiel Command to the Army Futures Command. The U.S. Army Combat Capabilities Development Command, formerly known as the U.S. Army Research, Development and Engineering Command (RDECOM), has the mission to lead in the discovery, development and delivery of the technology-based capabilities required to make Soldiers more lethal to win our Nation’s wars and come home safely. The command collaborates across the Future Force Modernization Enterprise and its own global network of domestic and international partners in academia, industry and other government agencies to accomplish this mission. CCDC is a major subordinate command of the U.S. Army Futures Command.